Canned Chicken to the Rescue! Did you know there’s a connection between what’s in your pantry and what’s on your thighs? It’s true, so pay attention to this often overlooked part of the kitchen–not only to what’s there, but also to what’s not there–like high-quality canned chicken that can stave off a hunger attack in a hurry. I just discovered Shelton's brand but assume it will be good, as I've always been impressed by their products. perpetual eating cycle that was threatening to turn me into a weight worrier? Protein Balance It’s nothing new and it’s very simple, as with everything else about healthy weight eating. And I know it works. Just yesterday, I was on the road and had breakfast at a Whole Foods: roasted veggies, roasted beets and yummy chicken curry salad. I was amazed when lunchtime rolled around and I hadn’t even registered a blip on the hunger meter. So if it’s simple and effective, what’s the catch? As always, implementation. For me, carbs like bread, cereal, tortillas, bagels, muffins, pretzels, chips and crackers were always easy things to have on hand. And they were easy to grab quickly to stave off hunger. Proteins, on the other hand, were far more problematic. I cooked animal protein only rarely, and it was rarer still that I had any leftovers. Plus, animal proteins have to be refrigerated, are messier to eat, and just didn’t hold the satisfying appeal of, say, a muffin. Pantry Stockers for Healthy Weight Meal Making So it was with delight that I discovered canned chicken, but not the miserable, indescribable stuff swimming in salt water that’s sold at drug stores. 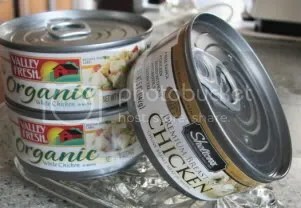 No, a can of Valley Fresh Organic Chicken is packed with clearly identifiable, very moist pieces of breast meat in a tasty broth (which can be used as a cooking element of its own as explained in the Bits and Pieces article.) Would I serve canned chicken as a main dish for dinner? Of course not. But is it perfect for adding a hit or protein to a salad I’m throwing together for lunch? You bet, and here’s a recipe where I used it: Green Salad with Chicken plus Fresh Fruit and Herb Dressing. Now, About the Cost. Valley Fresh is more expensive than vapid drug store chicken because of a time-honored principle we all know: “You get what you pay for.” Pay $1.79 and you get barely a serving of chicken that tastes like nothing, is mostly water and grosses you out. Or pay $3.69 and get a can of chicken that makes two, really tasty protein servings and is not contributing to environmental degradation. Make it even cheaper with a 10% case discount at Vitamin Cottage–and then you always have something on hand that can turn off the perpetual hunger machine–and help you return to a place of eating joy. Learn more about how to stock the pantry to make healthy weight meal making easy in the Whole Kitchen Way to Wholesome Meal Making.